Major Kendall Crocker, Veterinary Officer for the Australian Defence Force. This week we were able to interview Major Kendall Crocker, the Veterinary Officer for the Australian Defence Force. We acknowledge that the use of animals in the military is controversial. However, these animals need veterinary care and have welfare needs. According to Major Crocker, these are priorities and huge efforts are made to ensure that these animals enjoy excellent welfare. We asked him about his role and the different roles animals may play in the defence forces. I am a full-time Veterinary Officer with the Australian Army. I am the only full-time Veterinary Officer in the Australian Defence Force. I hold down 2 jobs. For 75% of my time I work at the School of Military Engineering (SME) at Holsworthy (Sydney) where I have responsibility for the Health and Welfare of the Army's Explosive Detection Dogs (EDD) managed by the Royal Australian Engineers. I conduct routine health checks and procedures (like vaccinations) on the EDDs at SME, manage the preventative health policies of the dogs and train the EDD Handlers in the health care and first aid of their dogs. For the other 25% of my time I working the Directorate of Army Health at Army Headquarters in Canberra. My role there is as the Veterinary Capability Advisor to the Australian Army. My responsibilities include expert input into Army's Military Working Dog (MWD) Health and Welfare Policies and advising the Director of Army Health on veterinary-related issues when they arise. I am also contributing to the project to establish new Army Veterinary Officer positions to support MWDs and other areas of need. How did you come to work in this role? I had been working on the development of Veterinary Capability for the Australian Defence Force since 2011. In 2012 SME created an Army Reserve Veterinary Officer position to give better support to its EDDs and Handlers. I was the first Officer to occupy the position. After working part-time as the SME Veterinary Officer for approximately 12 months, it became clear that a full-time Veterinary Officer would be of more benefit. I have been working in their role of full-time veterinary Officer at SME almost continually since. What are the roles of animals in the military? 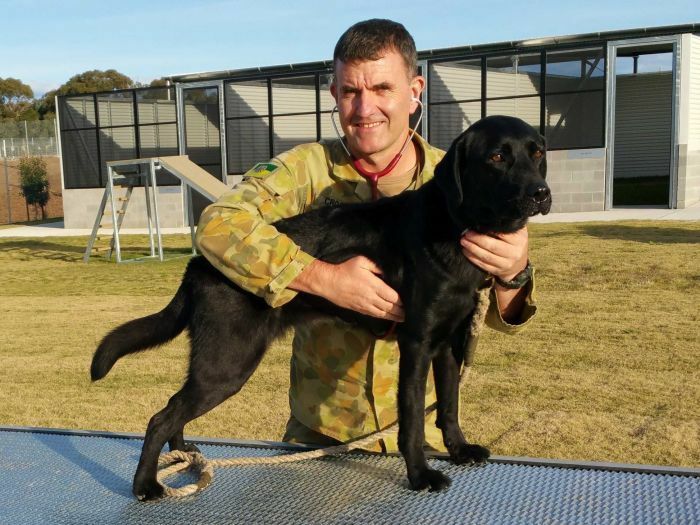 Army Explosive Detection Dogs (EDDs) run by the Royal Australian Engineers. They detect explosive materials, weapons and ammunition. They are used both overseas in combat areas and within Australia where they help keep large events such as the Olympic and Commonwealth Games safe for everyone. A range of working breeds can be successful as EDDs but the Army generally trains Labradors, Kelpies, Border Collies, Springer Spaniels and their crosses. Many dogs have been rescued from shelters and pounds (including death row) by SME EDD personnel and given a new and very happy life as an Army EDD. Army Military Police Working Dogs (MPWD). These dogs mainly perform security roles similar to civilian police dogs. They can be used to track and detain persons as well as provide security to important facilities. They are mainly Belgian Malinois and German Shepherds. Special Forces have MWDs which are trained in a number of roles from explosive detection to scouting/early warning. Air Force EDDs: similar to Army EDDs. What sort of situations do they need to work in? MWDs work in a wide variety of situations from high-rise buildings in Australian cities to remote mountain areas on the other side of the world. They need to be able to travel in all sorts of military transport including planes, helicopters, 4WDs, armoured vehicles and even Navy ships. They need to be able to work in hot and humid tropics and dry deserts as well as in ice and snow at times. How are their welfare needs met - how do you keep them healthy and happy? Army takes its duty of care to its MWDs very seriously. MWDs are considered to be "four-legged Aussie diggers" and are treated exceptionally well with their welfare being of paramount importance. Army strives to provide its MWDs with excellent accommodation, nutrition, exercise and environmental enrichment. MWDs enjoy a comprehensive vaccination program and highly effective internal and external parasite control to ensure they remain free from contagious and infectious diseases. The MWDs receive thorough veterinary assessments on a regular basis and get the best of veterinary care on the rare occasion they do happen to become sick or injured. An important dimension of meeting the welfare needs of MWDs is the fact that MWDs are teamed with a single Handler whose sole job it is to make sure their dog is healthy, safe, happy and expertly trained to work side by side with them to achieve the mission. The Handlers are extremely dedicated to their four-legged mate and well trained in canine husbandry and first aid. What has working with defence dogs taught you with about dogs in general? Working with Defence dogs and their dedicated Handlers has made me even more aware of dog behaviour and dog welfare. The dog is the most domesticated of all domestic animals and is capable of developing amazing partnerships with humans that are unique in the animal kingdom. 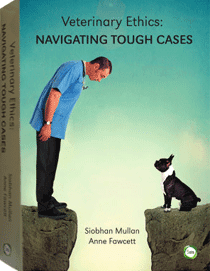 Working out if a particular dog is behaviourally suited to life as an MWD is a fascinating challenge that can yield outstanding rewards for dog and human alike. Through exposure to MWDs I have developed a greater appreciation of the importance of having the right dog in the right home situation as well. Too much emphasis is placed on how dogs look rather than what is going on between their ears. Consequently, far too many dogs are being bred with a pre-disposition to anxiety. That is one of the main reasons dogs end up in shelters and one of the main reasons individual dogs of suitable breeds aren't suited to army life. It is much harder to meet a dog's welfare needs if it is inherently fearful of the world around it. Working with Defence dogs has made me very aware of every aspect of animal welfare as it applies to dogs generally. As an Army Veterinary Officer working with MWDs, I am constantly analysing the life that we give our dogs with a view to always seeking ways to make it even better for them. When I contrast the great life that Army dogs lead with the conditions that some poor pets dogs have to put up with, it makes me realise how important continuing education for dog owners in canine welfare is.